A graduate of the world renown American Institute of Hypnotherapy, Transform Destiny, and The Heart of the Healer Org. 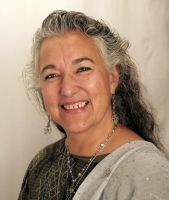 Dr. Leticia has been a student and practitioner of Hypnosis, Alternative Medicine, Spirituality, Shamanism, Metaphysics, NLP, EFT, and aspects of the Mind-Body-Soul connection for over two decades. Among other things, Leticia is a bilingual, charismatic visionary, therapist, healer, teacher, artist, designer, producer, and writer. Her mission is to help children and adults reach their potential through professionally-supported, one-on-one sessions and group workshops that have a measurable impact on people. Her focus now is to facilitate and bring transformation and Self Empowering through the application of● Shamanic Practices ● Energy Healing, ● Space Clearing, and ● Spirit Releasement, using her inner power and her sacred objects such as crystals, rocks, and herbs added to her ability to open portals between dimensions for healing past traumas, stuck negative beliefs, and freeing trapped spirits. And as a cancer survivor since 2002 developed “From Discovery to Recovery”™ a unique program designed to assist cancer patients in their process of going through tests, surgery, reconstruction, and recovery in a more relaxed and confident way. Offering them assurance, strength and professional assistance while they undergo the process of restructuring and gaining control over their lives, recovering health, improving self-image, and becoming empowered. the American Institute of Hypnotherapy (AIH) was a State approved educational establishment under the jurisdiction of the Bureau for Private Postsecondary Vocational Education (BPPVE). Degree granting authority at that time came from the Office of the Superintendent of Public Instruction under the provisions of Section 94310.3 of the Education Code of the State of California. Under California law, AIH was licensed to teach bachelor degree programs and to offer a Doctorate Degree in Clinical Hypnotherapy (DCH). Although originally offered as a PhD program, state regulators mandated that this award in clinical hypnotherapy be re-titled as a Doctor of Clinical Hypnotherapy (DCH) and modeled on a PsyD type program in which more emphasis is placed on clinical practice than on research.